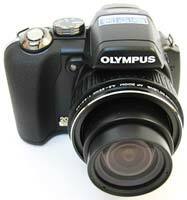 The Olympus SP-565 UZ is the latest addition to Olympus' now extensive line-up of ultra-zoom digital cameras. The star attraction of the SP 565 UZ is its 20x, 26-520mm zoom lens, covering everything from wide-angle landscapes to close-up action shots, complete with Dual Image Stabilisation to help keep your pictures sharp. A slightly smaller version of the SP-570UZ, this new model also offers a 10 megapixel sensor, 2.5 inch LCD screen, macro mode of 1cm, 13.5fps shooting (at 3 megapixels), Advanced Face Detection, ISO 64-6400 and a full range of creative exposure modes (P/A/S/M). The Olympus SP565UZ retails for �359 / $399 - Gavin Stoker discovers if it offers a winning combination of portability and zoom range. With more modest snapshot cameras being largely ignored by the general populace in favour of the all-encompassing camera phone, a market has opened up for those who want a more fully featured compact, but not quite all the bells and whistles of a DSLR. This has meant the introduction of a host of jack-of-all-trades super zooms, or as Olympus would prefer 'ultra zoom' � the theory being that the very broad focal range provided (whilst still in compact form) will be all most users need or want from a digital camera, so it shouldn't matter that the lens can't be changed, as on a digital SLR. Joining Olympus' existing 20x optical zoom model, the SP-570UZ, in its line up is the newer baby DSLR-styled SP-565 UZ, likewise an 'ultra zoom' that matches its predecessor in marrying a 20x reach (26-520mm equivalent focal range in 35mm terms) to a nowadays distinctly average resolution of 10 megapixels, while also featuring Dual Image Stabilisation (high ISO coupled with sensor-shift) and 13.5fps high speed sequential shooting (albeit with a resolution drop to 3MP). The Olympus SP-565 UZ's dimensions are smaller overall too, though marginally so, while for those who really want to get up the nostrils or ruffle the feathers of their subject matter, there's the similar ability to extend the lens reach via optional teleconverter to an incredible 4420mm equivalent. With face detection on board as standard (recognising up to 16 human faces in the frame) and a fixed 2.5-inch LCD screen at the rear � with alternative electronic viewfinder (EVF) above for shot composition � the �349 / $399 SP-565 UZ includes the ability to save data to the smaller microSD cards utilised by the aforementioned camera phones, alongside the less well-travelled (but Olympus and Fuji affiliated) xD-Picture Card. A yellow plastic card adapter is provided in order to be able to utilize microSD, which I can unfortunately envisage being lost down the back of the sofa in the first five minutes, along with the slip-on plastic lens cap included in the box. 48MB of internal memory provides the ability to capture around nine full resolution JPEGs if you've forgotten to insert a card, and the multilingual hard copy manual is unfortunately of the basic, 'quick start' variety, with the full tome on CD. As you'd expect/hope from a bridge model, RAW capture is offered alongside Fine Quality JPEGs, and there's the ability to shoot both file formats in tandem. With a maximum resolution JPEG committed to memory in under two seconds, a RAW file takes a good four, a status bar appearing on screen while it's being written to memory. Shoot the two together and you're looking at a wait of five seconds or thereabouts. In spite of its 'grown up' camera styling and feature set, plus with the four bog standard AA batteries required for power inserted at its base, the Olympus SP-565 UZ is portably lightweight at 373g (without accessories) when gripped in the palm. Though you notice its plastic construction up close, the Olympus' mottled black finish and leather effect (if shallow) rubber grip do their best to disguise the fact, and suggest at first glance that this camera is a sophisticated proposition made from sterner stuff, able to withstand the odd glancing blow or knock. At the front of the Olympus SP-565 UZ that gargantuan lens dominates proceedings, with a ridged rubber surround enabling a firm(er) grip when shooting handheld � crucial, unsurprisingly, at maximum telephoto. Top right of the lens on the curved ridge leading up to the flash is a button that, with a single press, causes the integral bulb to pop up ready for artificial illumination, while below is a trio of dots indicating a built-in microphone; unusually, an operational speaker has been secreted away at the base of the camera which is a little bizarre. Top left of the lens is a familiar dual use window for AF assist lamp and the self-timer indicator, and, apart from a gold logo re-affirming the inclusion of that 20x optical zoom, that's it for the Olympus' unfussy face plate. 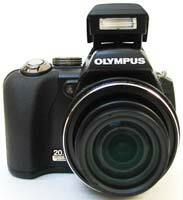 Examining the Olympus SP-565 UZ's top plate next, controls get a little busier, but not dauntingly so. Sloping forward onto the grip at the far right is a springy shutter release button surrounded by a rocker switch for progressing through the zoom range, just behind which is a clearly labeled 'power' button, plenty large enough but recessed to avoid accidental activation. Press this and in just under two seconds the rear screen bursts into life and the zoom emerges from its protective lens barrel, extending to maximum (26mm equivalent) wide-angle setting. The action of the zoom is both smooth and silent, meaning it's easy to quickly arrive at the picture framing you had in your mind's eye. A gentle press of the shutter release button and it's easy to ascertain the half way point also, an on-screen AF point highlighted in green confirming focus/exposure has been determined and the shot is ready to be taken. 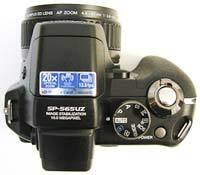 To the left of these two controls is a large ridged shooting mode wheel, similar to those found on entry-level DSLRs. As well as full auto capture, if we move anti clockwise around the dial we come to the familiar creative quartet of program, aperture priority, shutter priority and manual, plus a customizable My Mode option, via which the user can store (and rapidly access) preferred settings, 25 pre-optimised scene modes, plus a built-in function guide that will be familiar to users of Olympus compacts, a video capture mode (640x480 or 320x240 pixels at 15fps or 30fps), and finally a means of accessing playback. It's less usual these days to find the latter shoehorned onto a mode dial � as a time saver there's usually a dedicated review button at the rear of the camera so you can quickly check a shot no matter the capture mode selected. And so it proves here � more on which later � so the user has in fact two means of reviewing images. Incidentally, the SP-565 UZ's affirmative bleeps and operational sounds are a tad loud, so luckily they can be muted if so wished. Remaining atop the camera and jumping over the hump for the built-in flash we find a dioptric adjustment wheel nestling into the protruding eye relief for the electronic viewfinder, the former adjustable with a thumb spin. Maintaining the camera's compact dimensions, at either end of the top plate are eyelets that point upwards for attaching the provided strap. Moving to the SP-565 UZ's backplate then, we find the lion's share given over to an adequately sized and bright 2.5-inch, 230k dot resolution LCD, with the alternative of the EVF, offering 100% field of view directly above. Between the two there's an unmarked (except for a screen icon) button for switching back and forth, dependant on your preference for image composition; the view via the EVF is obviously smaller and it's also darker, so while occasionally useful for avoiding distractions in the great outdoors, for shooting interiors it's better to rely on the less murky, larger screen. Top right of the LCD is a gently curved and padded rest for the thumb, below which is a grouping of small function buttons with familiar four-way toggle dial/control pad at their centre. The top most and smallest button, marked only in vague fashion, acts as an automatic exposure lock in the creative capture modes. Beneath this is a pairing of buttons. On the left is a self-explanatory 'menu' button. Press this with your thumbnail and a range of cartoon like icons appear on screen denoting the various options open to you. These vary dependant on whether the user is in capture or playback mode. In capture mode, users have access to image quality � with the option of JPEG, RAW or RAW + JPEG � the ability to reset all functions, access set up mode, the ability to combine panoramas in camera (hit and miss as it happens), silent mode, plus the main, centrally located camera menu. As you'd expect from a bridge model the latter presents a comprehensive range of options � governing metering, focus and the ability to adjust sharpness, saturation and contrast in-camera � this range spread across five folder-type menu screens with numbered side tabs. In auto shooting mode however this main camera menu is disabled, leaving the user the ability to adjust only JPEG size and compression level, reset everything, access set up, or mute the camera's too loud operational sound. In review mode, pressing 'menu' presents the user with nine options including slide show, in-camera editing, the ability to order your shots for direct printing, Olympus' red eye and lighting adjusting 'perfect fix', set up menu, a calendar option, a delete option plus, again, silent mode � in addition to the main, centrally placed, playback menu. To the right of the menu button we find a second means (after the top plate mode dial) of accessing playback, which also acts as a direct print button for the PictBridge enabled camera when hooked up to a compatible device. Below this is the previously mentioned four-way toggle control, featuring an OK/Function button at its centre. Around the dial are, at 12 o'clock, a means of adjusting exposure (+/- 2EV), and at three o'clock, choosing from the flash options (when the bulb itself is raised). 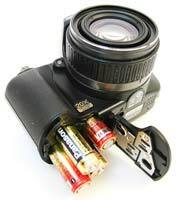 These include auto flash, red eye reduction, fill-in, red eye + fill in, flash off, slow sync and slow sync plus red eye. At six o'clock on the dial are the self-timer options: either off, two seconds or 12 seconds. At nine o'clock is a setting for calling up the Olympus SP-565 UZ's macro options, with super macro offering close ups down to 1cm from your subject. A press of the central function/OK button meanwhile instantly brings up an L-shaped toolbar on the left of the screen; from the top users have the option of choosing from single capture, sequential, high speed, pre-capture (continuously storing five frames in the buffer memory) or bracketing modes. Next down is the option to manually select from a range of white balance settings � though in this respect the SP-565 UZ seems more reliable than previous generations of Olympus's � then metering, pixel count and quality. Bottom left of the four-way pad is a display button, which, as expected, brings up a nine-zone compositional grid on screen, while a further press summons up a useful live histogram. To the right is a button dedicated to Olympus' Shadow Adjustment technology in capture mode, handy for evening out exposure when shooting a dark subject against a bright background, while in playback the same control acts as a useful dedicated delete button. 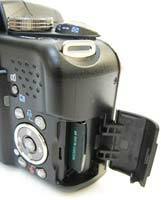 On the right hand flank of the camera, viewed from the rear, is a door with catch protecting the slot for removable media � handy, as cards can be swapped when using the camera on a tripod � while the opposite side of the camera features a plastic cover for USB and AV out, plus external power in. At the base of the SP-565 UZ we find a familiar screw thread for the aforementioned tripod and alongside this a sliding cover for the four AA batteries required for power, with lockable catch to avoid them dropping out after a knock in transit. 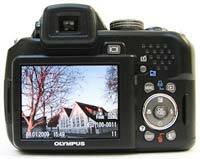 Overall, the use of the Olympus SP-565 UZ is intuitive, it's quick to respond to button presses and dial twists with TruePic III processor on board, which means there's little here that will scare off those upgrading from a snapshot camera. But how does it fare when it comes to image quality? PhotographyBLOG is a member of the DIWA organisation. Our test results for the Olympus SP-565 UZ have been submitted to DIWA for comparison with test results for different samples of the same camera model supplied by other DIWA member sites.